I wanted to tell everyone about another project we’re working on that we haven’t talked about much. 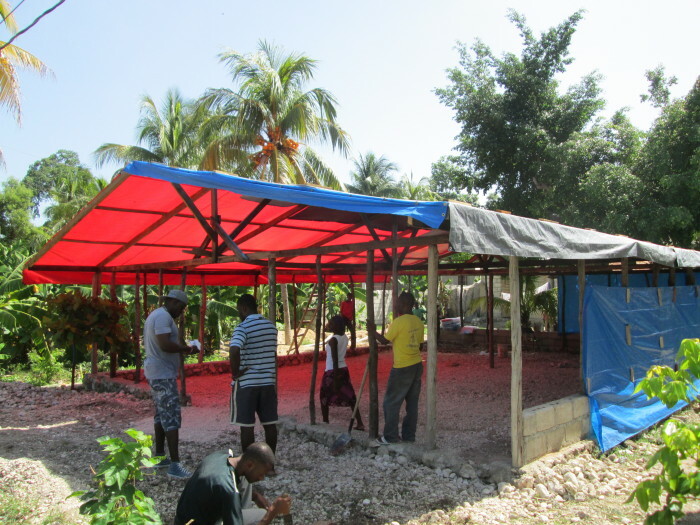 Everyday, we feel a renewed sense of purpose and responsibility, and we hope there will always be some way to generate funds to help support our projects and our friends in Haiti. We received some pictures of this project from Paul, and our hearts were awakened to the idea (AGAIN) that we really can help with some big things if we set our minds and hearts to it. The beautiful thing about Haiti and it’s people is how hard they work for each other and the betterment of their community. 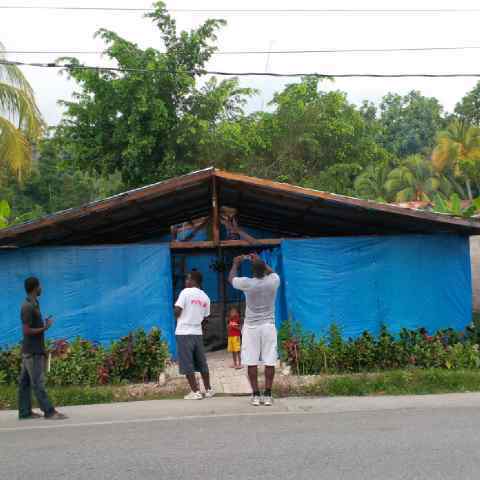 These photos (below) just reiterate the fact that Haitians help themselves. They’re digging, building, volunteering their time and energy for the community they live in. For us, helping those that help themselves, is a no-brainer. 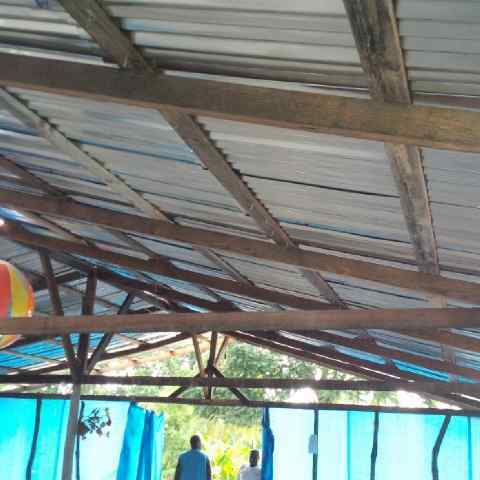 A little about the project being started in the photos below, is the building of a church that will also be used for our friend Pastor Dorcean’s professional school (New Vision Professional School). 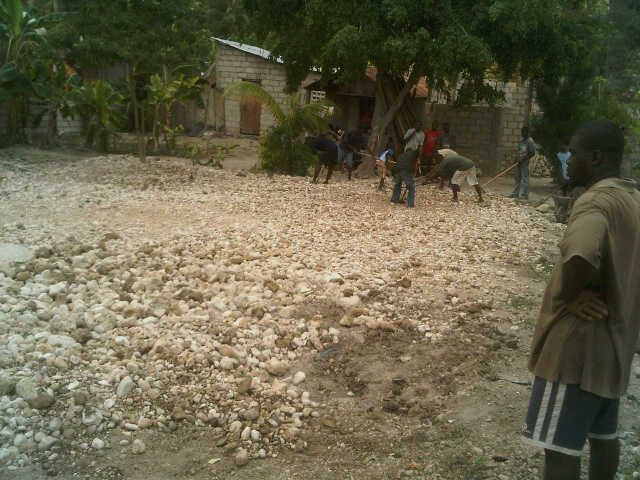 The church members are preparing the land in the photos below. 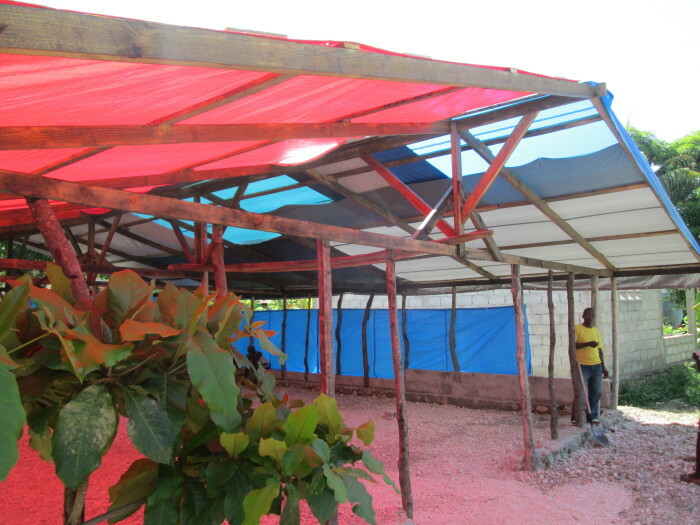 This professional school will open doors of opportunity for young Haitians to learn a trade. The classes that are currently being taught are English, Electrical, Plumbing, Ceramics and Sewing in a VERY small room with limited supplies. This is the lot where the school’s new church/professional school will be built. Food is prepared for the volunteers. Lumber has been collected to begin construction. 5.14.13 UPDATE: This is the most recent photo we have of the project. 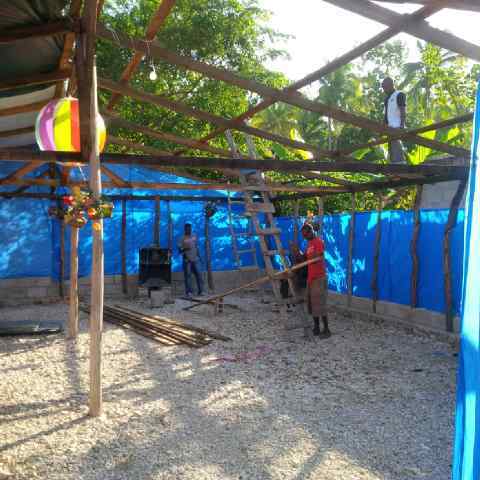 With fundraising proceeds, we were able to send enough funds to begin construction on the church, once the structure is ready and sturdy enough, a roof will be placed. 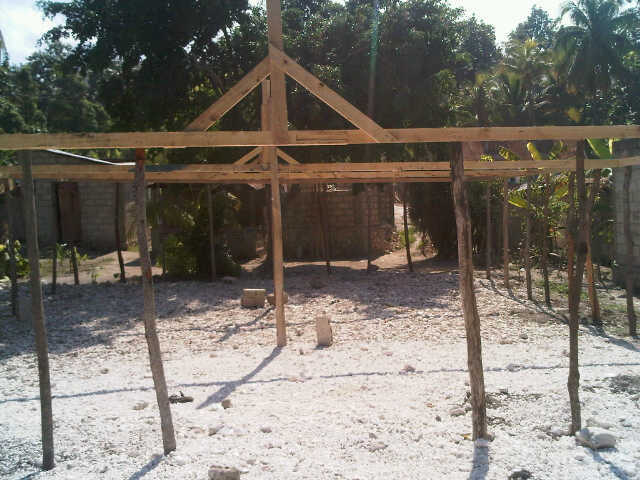 7.25.13 UPDATE: We recently got back from a trip to Montrouis, Haiti and took some photos of the structure. Progress has been made. 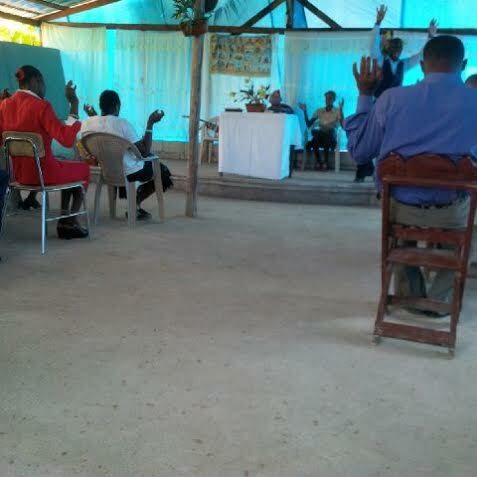 We sent funds for 10 bags of cement for a bathroom by the church, but they’re still in need of cement for the floor of the church. They’ll need many more bags for the floor, possibly 50, totaling around $500 USD. We’re asking for your support with this project, as we believe it will be vital to the community once it’s complete. Please consider making a cash donation to help us help them. 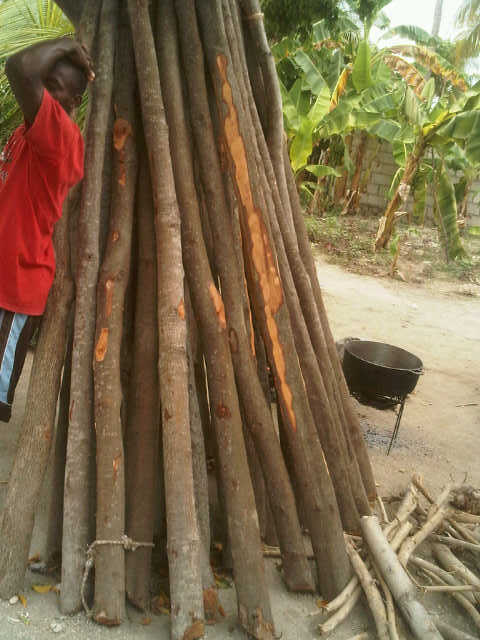 Magic Beans’ hope is for young Haitians to be self sufficient and independent. This professional school will help teach a valuable trade that can be used to generate an income for the student and their families. As we receive updated photos, we’ll share them with you. We’re anxious to see this completed project, as well!! 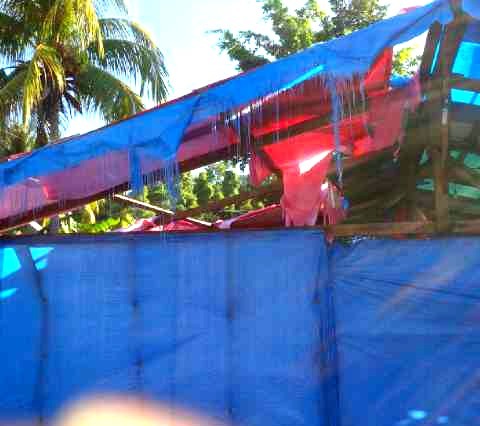 10.31.13 UPDATE: It didn’t take long for the weather to take it’s toll on the temporary tarp roof Nouvelle Vision was using. Through the month of October, MBC spent every weekend fundraising. It paid off! 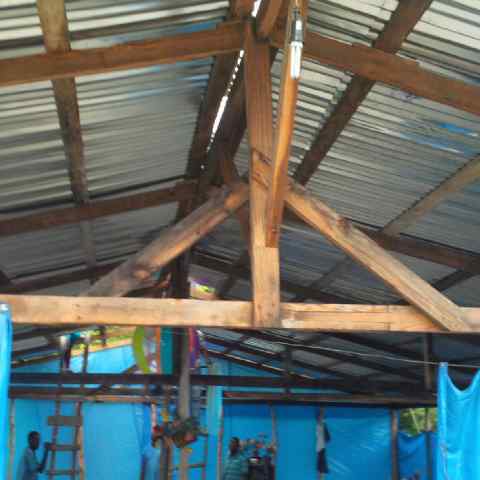 Soon, Nouvelle will have a new roof & we’ll have new photos to share. 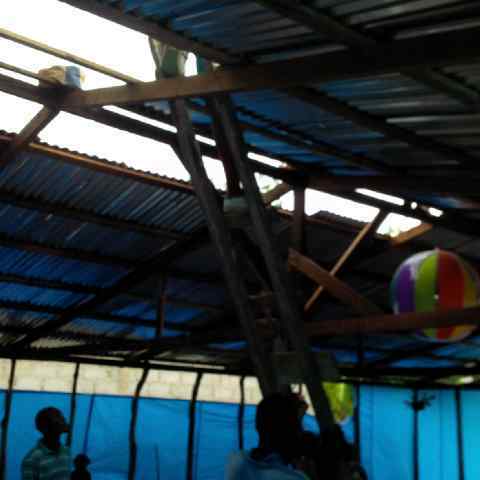 11.5.2013 UPDATE: We received a few video messages and a lot of pictures today of the roof during construction. What a happy day! Workers began this morning and worked through the day. Hard working, dedicated church members and volunteers even continued working through the rain. Here are some photos we received today. We hope you enjoy them as much as we do! 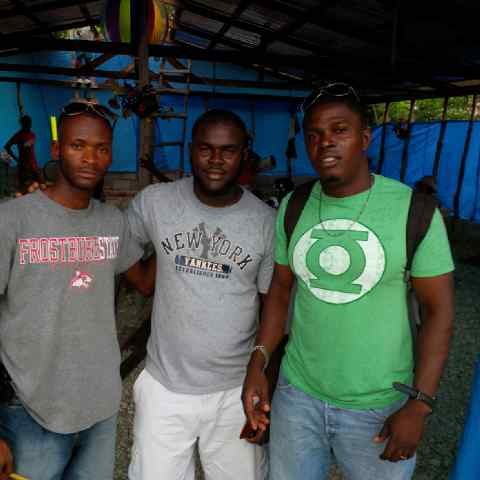 Ludovic (a church member), Pastor Dorcean & our partner in Haiti, Kesnel (Paul) Toussaint. A group of amazing men. A concrete floor has been poured! 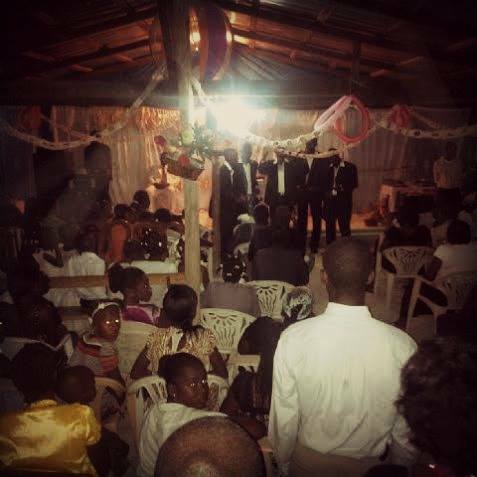 Church members, pastors, Paul & MBC all pitched in to make this happen. This photo was taken at Nouvelle Vision’s 1 year anniversary party.